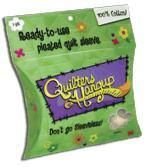 Click here for Quilter's Hang Up quilt sleeve. The Hang It Dang It Quilt Hanger is a self-levelling system that only needs one person and one nail/screw/hook to hang your beautiful project on the wall or from the ceiling. Large – from 35 inches to 63 inches expanded. Weight isn't an issue either, unless your project is over 18 kilograms or the nail isn't anchored into the wall. All you need is a sleeve to fit the rod inside and then it's invisible. What you see in the picture above is the magnetised holder that hooks onto the nail in the wall. No hole in the quilt sleeve needed. Your project will sit proudly on display, admired by all who come to see it. 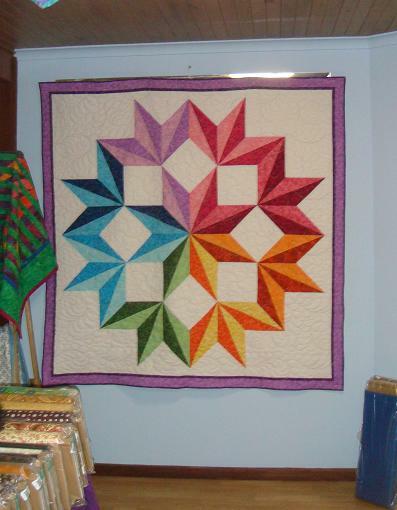 Look at how straight the quilt on the right is! How does it work? You can watch the 2 minute video below to see how easy it is to use. All that you need to make the most out of the Hang It, Dang It Quilt Hanger is a quilt sleeve for the hanger to sit in. Easy? It has just gotten easier with the "Quilter's Hang Up". The Quilter's Hang Up is a ready-made quilt sleeve that has been designed to ensure that your quilt or artwork hangs flat, so that you can show off the entire project - top to bottom. Simply cut off the amount that you need from the pack (you get 3 yards in a pack), hem each end and then stitch the top and bottom to the back of the project. Viola!